Occupy: camping or revolution? Like most things, I came to it late. I saw the London Finsbury Square occupation, and then, the Edinburgh St Andrews Square scene, and later still the Meadows iteration, when it moved on. I didn’t participate, investigate, or even photograph it at the time. It’s only now, a year later, I got around to reading about it properly, spurred by an excellent review of of Occupy-related writings by David Runciman in the LRB. Runciman’s argument revolves around the slogan, ‘We are the 99%’. Too simple, he thinks. A lot of that 99% are actually doing fine, making any substantive action unlikely. A more targeted campaign he thinks is needed; it’s too simplistic, too unfocused to have much chance of succeeding. I’m inclined to agree. The convulsions of the post-2008 financial crisis were something to behold, but still nothing compared with the supposedly banal decade of the 1970s. If you grew up in Britain then, most weeks threatened apocalypse. It wasn’t just the three-day week and cooking by candlelight (1974), but the IMF bailout (1976), and unburied corpses in the street (1978-9); more seriously it was the ever-present threats of terrorism and nuclear annihilation. My home city of Manchester, was for most of the 1970s a filthy, dangerous slum. Almost every part of its public realm lay in runs, many of them relics of the Second World War. Everything else was thick with graffiti. My parents, if they did not actually believe the world was about to end, certainly acted as if they did. They bought a huge wreck of a Victorian house and set about turning it into a self-sufficient urban farm. They subscribed to Vole, Richard Boston’s strange ecological magazine. They took their children on regular pilgrimages to the Centre for Alternative Technology in Machynlleth. They talked darkly of Britain returning to an agrarian economy. They hinted we might grow up to be peasants. They instilled in us – without, I am sure, ever meaning to – a pervading sense of emergency. Everything was to be saved, and re-used, especially food on the basis ‘you never knew where your next meal is coming from.’ When travelling, we were to take no more luggage than each of us could carry, in case we had to run from some unspecified threat. And if I remember rightly, we were instructed that if anyone were to appear with in a room with a gun, we were to lie flat on the floor. These were the beliefs of otherwise well adjusted, happy, professionals, with seamless careers and pension records. Now if theythought the Seventies was one long emergency, what did others, with less security, think? Anyway, all this clouds my view of Occupy. By comparison with my (possibly mis-remembered) seventies, today’s protestors inhabit a world of unparalleled wealth, opportunity, and order. You don’t have to be a right-wing nutjob to believe this; you just need to have been around the block a few more times than they have (the evolutionary psychologist Stephen Pinker agrees – see last year’s Better Angels of Our Nature). What Occupy points up, however, that credit cards and cheap food and flights don’t necessarily make for happy citizens, if a tiny number of those citizens appear to be able to circumvent the rules. It’s simply not fair, and when it goes wrong, as it did 2008, we all suffer. Noam Chomsky’s Occupy is particularly lucid on this, and the resultant anger, which is real enough. You have to feel pretty aggrieved, and pretty disenfranchised, to risk jail, and then risk it again through repeated actions. All this is winningly developed in Occupy! Scenes From an Occupied America, an impressionistic collage of first hand accounts of OWC and other ‘scenes’, interspersed with cartoons, photos and graphs (its low-fi production is a bonus too – nicely redolent of late-60s-early 70s conceptual art). Where Occupy falls down however, at least in my limited understanding, is the lack of a programme. Runciman covers this well: if Occupy targeted youth unemployment, it might make a real, structural, difference. But the 99% coalition is too broad, too diffuse, and includes too many folks who are simply too comfortable. Inside Occupy too, the lack of programme is palpable. On pp. 65-6, Chomsky himself states he doesn’t think anyone has the authority to say what a future society might look like. ‘These things have to be worked out by people who are living and functioning in freedom and work out for themselves what kinds of societies and communities are appropriate for them,’ he says, weakly. Well, that’s not enough for me. It’s not enough because if you go back 40 years, there are any number of Occupy-like events that not only protest, but model new ways of living – and it is in the living that I understand value. Drop City (Colorado, 1966-9) is one I’ve lately written about, and it supplies the pattern-book for Alex Hartley’s dome, depicted above. But even my parents’ generation in post-industrial northern England had a plan, involving self-sufficiency, re-use, slow living, thick walls, small windows, anti-urbanism and lots of vegetables. Hebden Bridge in West Yorkshire was, and probably still is, the global epicentre. In a strange way it is more of a vision than Occupy appear to have. I say ‘more’ because it is so easy to identify, and indeed, caricature (as many did). But the fact that it is so identifiable means, as I understand it, that it must have been real, lived, and in a peculiar way, popular. 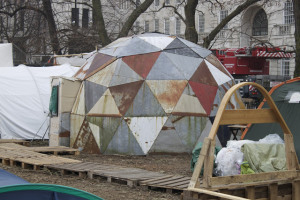 Occupy might happily embrace the 70s eco-vision – or not. It’s actually very hard to tell. Perhaps their tentativeness about vision is indicative of a desire to have it both ways, to protest the capitalist city but also enjoy its comforts. At any rate, Occupy still looks to me like camping. D. Runciman, ‘Stiffed’, London Review of Books (25 October 2012), pp. 7-9.